I am not sure how many of you pay attention to advertising but I actually like to watch commercials. The super bowl commercials are the only reason I stream the programming from the US. Who remembers the little boy as darth Vader in the car ad? Genius. Even Beyoncé’s Pepsi ad is really good, and who is going to complain about seeing more Beyoncés? A lot of the time they are dismissed as background noise but I think you should really reconsider your opinion about ads. I found that if you paid attention to them, some are really quite clever; some even funny and witty. Some have the best tag lines and are entertaining for those 30 seconds. Even in Australia one of the most influential ads have ingrain themselves in to popular culture. Can anyone recall the Tourism Australia campaign? The Classic Line of “Throw a shrimp on the bar-bie” has sparkled a long held food tradition of grilling seafood in Australia. Every year my family has a big seafood platter with tons of prawns and the annual visit to the fish market. Good times. Sometimes when Food is promoted as healthy a bit annoying. Healthy for one person may not be working for another. Now my veering away from quick breads has been a long one but with the lack of time (more on that later) and my craving for savoury bread; I decide to give this one ago. 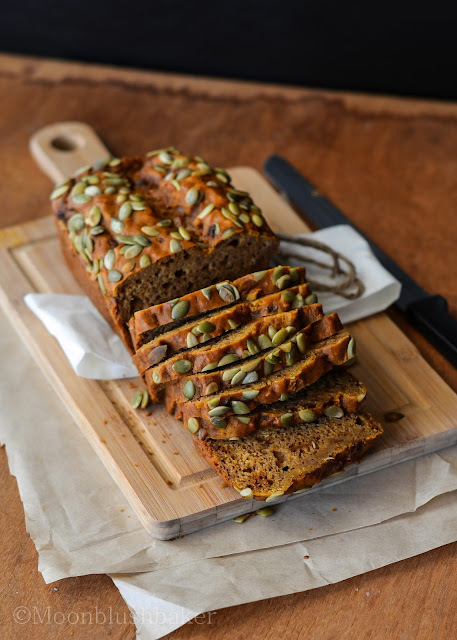 By roasting the pumpkin then pureeing it adds a depth of flavour which is not found in normal pumpkin bread. 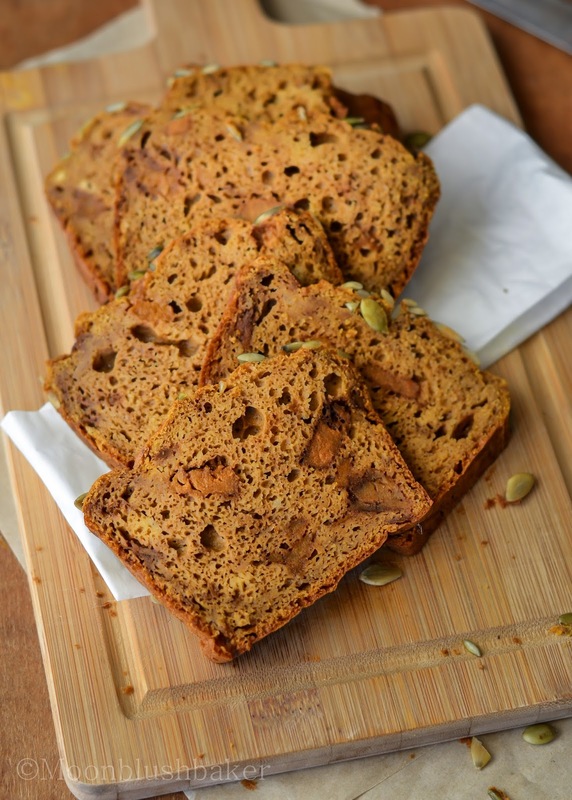 An addition flavour boost comes from the par baked pumpkin cubes in the bread which are roasted in a bit of brown butter. 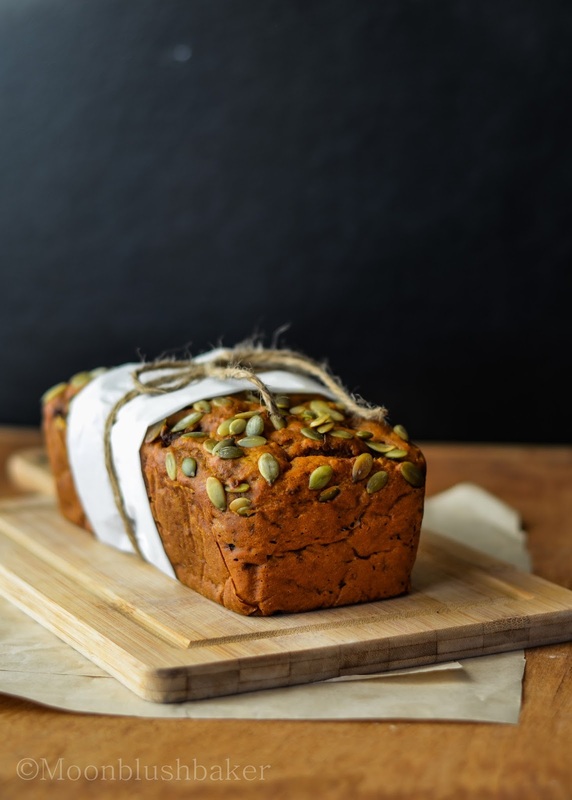 A quick and simple loaf but flavourful. Here I tired to make the best out of a few ingredients, so you see not everything has to be long and complicated. 450g Roasted mashed pumpkin. (Oven roasted at 200C till tender then mashed with 60g butter). Allow to cool before using. Brown the butter in a large sauce pan until it begins to change colour and smells toasty. It should take about 5 minutes. DO NOT LEAVE THE PAN. Once browned, add pumpkin tossing and cooking for about 5 minutes or until semi firm. Place on another plate and leave to get cold. Preheat oven to 160°C. Brush an 11 x 21cm (base measurement) loaf pan with melted butter to lightly grease. Sift the flour, salt and chili powder into a large bowl. Make a well in the centre. Place the pumpkin, milk, butter and egg in a jug, and use a whisk to stir until well combined. Add the pumpkin mixture to the flour mixture, and stir with a large spoon until just combined. Fold in roasted pumpkin cubes with all the juices. Combine until just mixed. Spoon the mixture into the prepared pan and smooth the surface. Cut a line down the middle of the batter with a knife. Bake in preheated oven for 50 minutes or until a skewer inserted into the centre comes out clean. Remove from oven. Hahah I love how greek yogurt has become such a baking staple in past years that plain yogurt now has to be specified as runny yogurt 🙂 This bread looks AMAZINGLY moist and has me excited for autumn baking. I know… Now I i love my yoghurt but the runny stuff is better for baking in my opinion. Thanks for the amazing comment! Yum, love the look of this bread. Pumpkinny goodness. If you love pumpkin you will not be disappointed sarah. The butter is the best part! This is gorgeous! And I have been baking with pumpkin all year – just not blogging about it. Such a versatile and wonderful ingredient, especially for baking. Your bread turned out so good looking! Mmm, and love how you wrapped it up. So pretty! That is great averie! 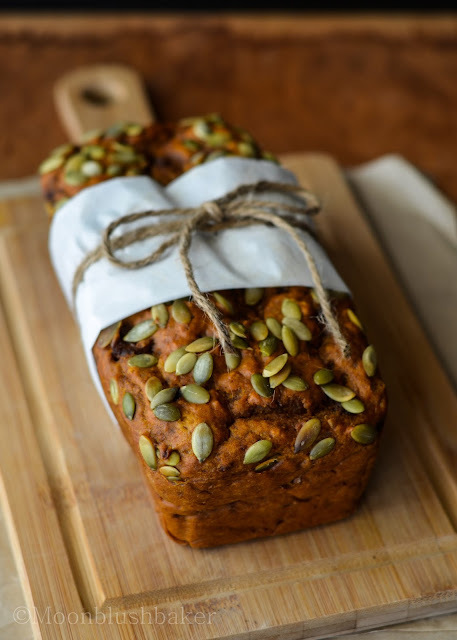 I bake with pumpkin all the time too as it make it way into pie and pancakes.I think the dual power of pumpkin (aka sweet or savoury ingredient) makes it so popular. The wrapping is so easy! You need to wrap up that cherry and mixed berry cake for me! 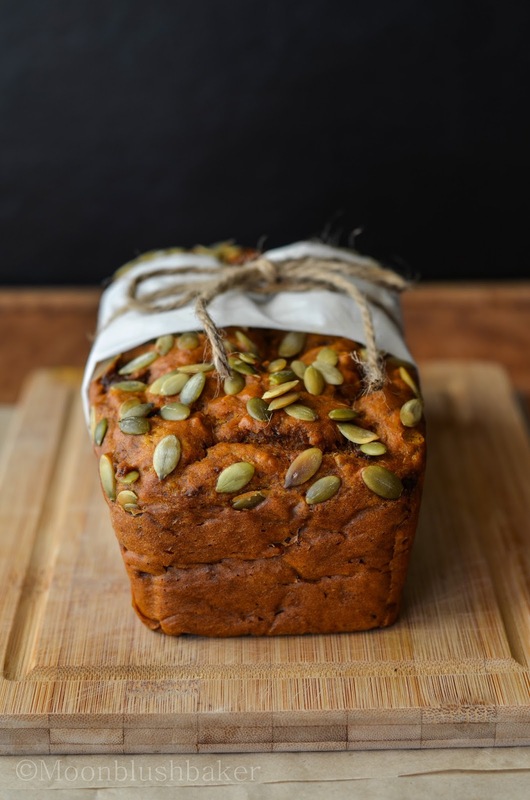 You had me at brown butter roasted pumpkin cubes, what a scrumptious bread! I need this! Thanks for linking up with What’s Cookin’ Wednesday! thanks Karly! love your latest post toffee is my fave! August 6, 2013 @ 5:40 am Elizabeth -SugarHero! 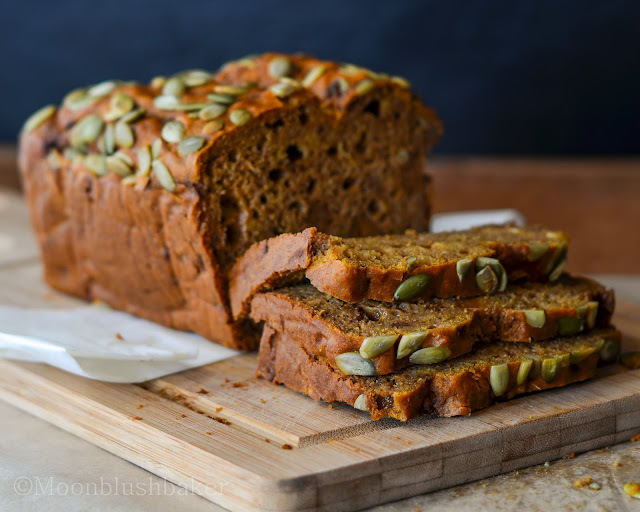 Pumpkin bread is one of my favorites! 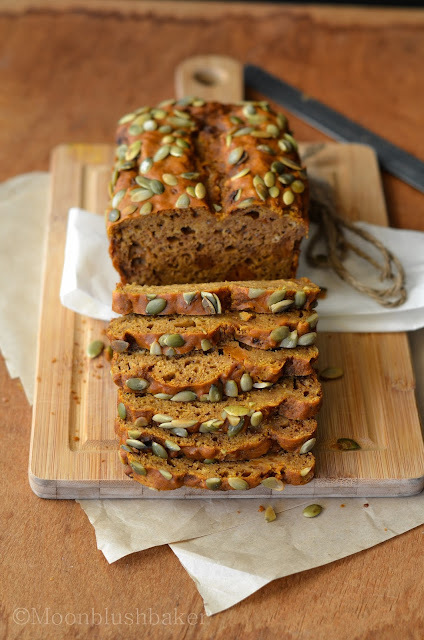 This is such a delicious-looking version, love the pumpkin seeds on top! Pumpkin bread is so raw here in Australia, so I had to try and recreate it at home. The pumpkin seeds add a another level of texture to the cake. Thanks Elizabeth! Your photography is so beautiful I feel as if I could just reach out and pick up a slice of this bread…or even lick the screen. Aww thank you Janet, it is so lovely to here replies like this! 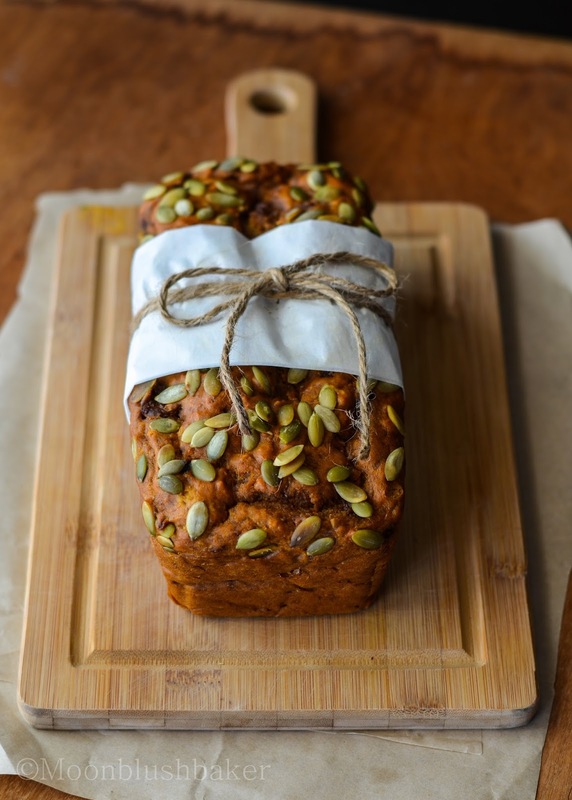 I hope you enjoy the recipe for this bread as much as I did.